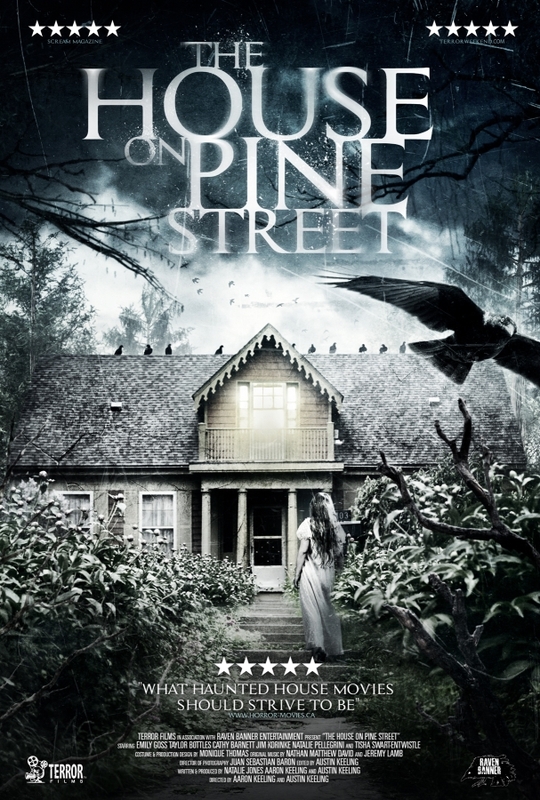 ​TERROR FILMS starts to unleash its slate of 2016 titles, beginning with the award winning and critically acclaimed film, THE HOUSE ON PINE STREET. The first phase of the release will begin on September 30th, 2016 on the following TVOD platforms: iTunes, Amazon Instant, Google Play, Vudu, Xbox and PlayStation. Pre-Order is now available on iTunes: http://geni.us/jaXlG7l. The company hopes to expand the release in the coming months on platforms such as Netflix, Amazon Prime, Hulu, YouTube, Fullscreen and Vimeo On Demand as well as major VOD and DVD retailers. Those dates will be announced once they have secured placement. The film is also set to debut theatrically in at least two cities, which have yet to be finalized. The story revolves around Jennifer (Emily Goss). She is seven months pregnant and reluctantly returning to her hometown in Kansas, after an unexpected mental breakdown. Coping with her fears of motherhood, a strained relationship with her husband, Luke (Taylor Bottles), and the overbearing presence of her own mother, Meredith (Cathy Barnett), Jennifer struggles to regain control of her life. But when strange things start happening in their new rental home, Jennifer begins to fear that it may be haunted. Alone in her convictions, Jennifer is forced to question her sanity as she attempts to find out what, if anything, is plaguing the house. The House On Pine Street was directed by Aaron and Austin Keeling. The directors co-wrote the film along with: Natalie Jones. All three of them produced the film along with: Monique Thomas. The film was an official selection at 14 domestic and international film festivals including – the New Orleans Horror Film Festival. Here, it won the Best Feature award, Nocturna Madrid International Fantastic Film Festival, Molins Horror Film Festival, and the Kansas International Film Festival. As part of the marketing efforts Terror Films will release a new clip every week leading up to the film’s release, starting with this first sneak peek. Be sure to check out the film that critics are calling: “Creepy” – Variety/ “Disturbing…This movie had me so on edge.” – Horrornews.net / “A classic supernatural story” -Horrorhomeroom.com.